The part color called [No Color] has been renamed to [No Color/Any Color], to better match it's new meaning. 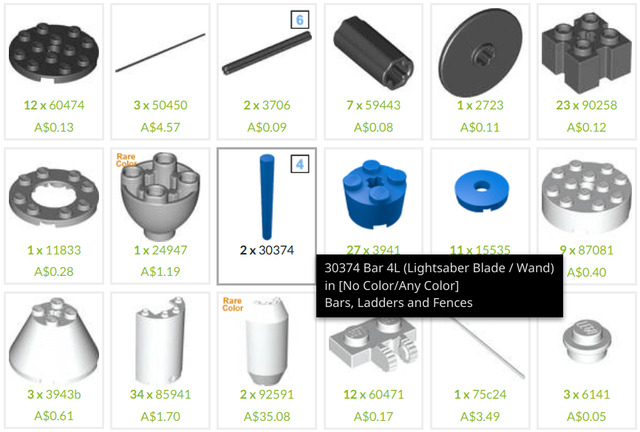 In official LEGO Set inventories it's used for parts that don't have a specific color (e.g. sticker sheets). Previously, when used in MOCs it was treated as an error. Now, when used in MOCs it indicates that the part can be any color you like as it won't have any impact on the final model - usually because the part can't be seen. Other Rebrickable features including Buy Parts and the Build engine can now use this information to improve their results, as described below. 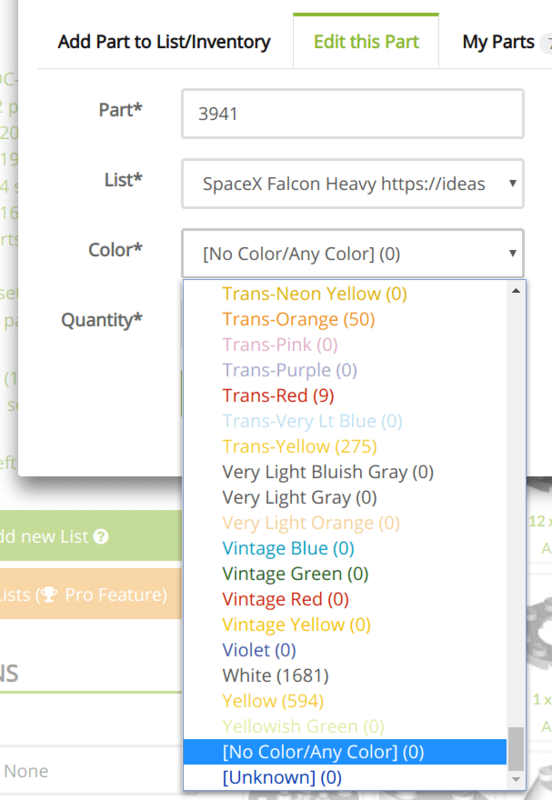 To modify a part, simply click it, choose the Edit tab and pick the color at the bottom of the drop down list where the “special” colors are. Note that the [Unknown] color is still treated as an error and should be fixed. To make it more obvious which parts are being treated specially, they will appear in the default Blue color in inventories. When searching external BricLink/BrickOwl/ToyPro stores, parts in [No Color/Any Color] will be matched against the cheapest available colors for each store automatically. If the store needs to fulfil the quantity requested by using multiple colors, it will. So for example if you ask for 1000 x[No Color/Any Color] parts you might get back something like the image below. This extends to the Multi-Buy page too. Clicking the Add to Cart buttons will cause those [No Color/Any Color] parts to be added as whatever real colors the store had in stock. The same thing applies when adding parts to the external site wish lists/wanted lists. Note that BrickLink and BrickOwl differ slightly in how they show the parts. BrickLink will show the (Not Applicable) color so you don't actually know what you will get until you add it to the store's cart. BrickOwl shows the actual color the store has in stock. The Build engine has also been updated to handle these parts differently. It will match the [No Color/Any Color] parts against any available parts you have in your buildable collection. This works regardless of the Color Matching option you are using. This all relies on the MOC designers modifying their existing MOC inventories and new submissions to use this color when relevant. In some cases, designers are already using unusual colors (e.g. Pink) to indicate this so a simple Bulk Edit can update them all in one hit. For an example of one already done, you can checkout MOC-18916 The Empire over Jedha City. If you are looking to Buy/Build a MOC and want to modify the parts yourself, I suggest copying the parts to a Custom List where you have full control over everything. If it’s a Public Custom List, you can even post a link to it in the comments of the MOC to aid other users or even the designer in updating the inventory. BTW, perhaps you can use some sort of AI to help the designers set some of their pieces as any color? For some designers of large MOCs, it's just so exhausting to set thousands of pieces as "Any Color". 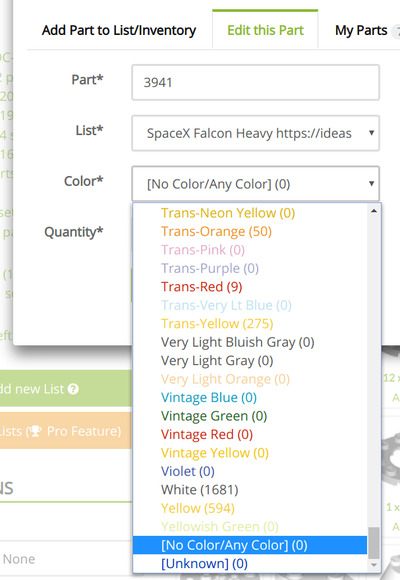 You can actually use bulk edit to select multiple parts and change their color all at once. Can a patterned color be used for the display? Like stripes or something? Cool! I had myself asked for this too. Perhaps an extra popup to specify a color to translate to "any" when importing LXF's? OR, just simply pick a very rare color, like "metallic sand yellow". If anyone really uses any of the 11 parts in that color, he can just fix it manually after import. Also, "any sub-type" would be useful as well. I understand that this could as well be a global flag for the buyer, but sometimes a specific sub-type matters. By sub-type I mean, for ex, the common 1x1 tile+clip, which exists in several forms. This part alone can make auto-looking for parts a problem, especially in this period where those clips are slowly switching from one type to another (prices have flipped in just 1 year). Could you implement this feature also when comparing sets? It could be also as a checkbox. In fact I immediately tried it with my MOC 15128- Vase﻿, which has a lot of internal supports which I had to try in all pinkish-purplish hues. But the bulk edit button seems to have stopped working, and changing the bricks one by one is a pain. Also, the bricks of [no color\any color] appear as blue. That can be misleading for someone just scanning the inventory. Hmm, so maybe it wasn't just me. I recently tried bulk-editing on a MOC inventory and it didn't work. What I did was export the MOC inventory to a custom list, bulk edit there, then export the custom list and replace the MOC inventory with that. Also, I agree with that the blue color might be a bit misleading. Maybe an extra label could be useful, like there currently is for Rare Color. The bulk edit should be working now. We have been talking about using a different color for Unknown/No Color parts, something that can't be easily mistaken for a real color, but haven't come up with a good solution yet. I suggest rainbow! ;) make it psychedlic and recognizable. Also what says "any color" better than a rainbow? Can you please post it in the Bug Forum with enough details so I can try to reproduce your issue. I imagine we can also make public custom lists of Lego official sets where we ne-colored everything that's not visible in the end! That could be really useful for people like me with a lot of different pieces but not many of each colors! It would be great for building official lego sets, but problems with further using such inventories for MOCs are possible. Maybe dual-version inventory or selectable "Shown/Hidden" part? But realise it is very seriuos and big work i think. What do you mean with this sentence: "BrickLink will show the (Not Applicable) color so you don't actually know what you will get." When you Add to Cart, it just shows a blank image with (Not Applicable). Strangely, it shows a proper image when you use the Add to Wanted List. It might have just been the parts I was testing that did this though. No/Any color parts can be (Not Applicable) in a wanted list and Bricklink will understand that and will show a random color. But, you can't actually order a (Not Applicable) part right? Except for some parts like Stickers, the seller needs to know what color you bought and Bricklink needs to know what price to show so I don't quite understand how you can get (Not Applicable) parts in a bricklink cart. 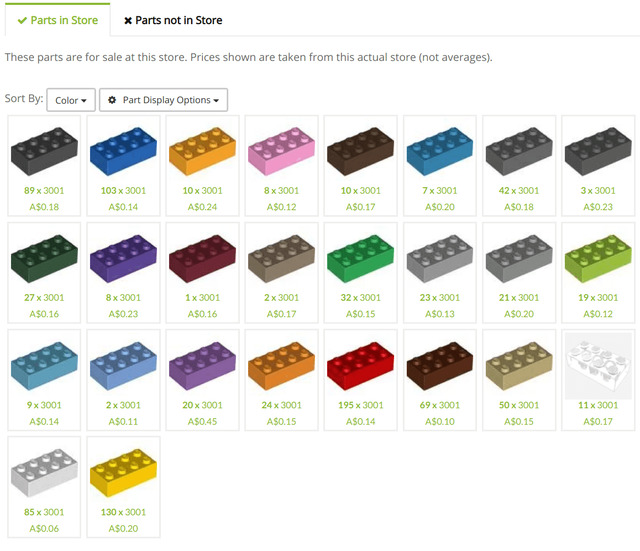 This is working properly now - it will add the real color to the BrickLink shopping cart. Oooh, cool! Really excited to try this out. In fact, I'm pretty sure I have some old instructions up here that use red/blue as 'any colour'. Not that anyone is trying to build them anymore, but it'll be interesting to go back and modify the inventories. Hopefully this will start a trend that will carry over to model editors. It would be really nice to design a model right from the get go taking this into account and having it carry through the entire process of making instructions and uploading here. I guess LDraw already has some special/reserved colours that could actually be used. 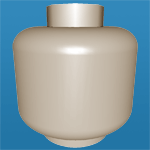 Maybe when importing an LDraw model all parts with colour 16 could be mapped to this new colour? I had been putting this off partly because it requires MOC designers to modify their inventories to take advantage of it. But perhaps some better integration with the tools would be possible. Parsing the LDraw file format is a nightmare, at least it was for me :) Color 16 on sub-models is supposed to take the color of the model that includes it, but if top-level parts use color 16... then maybe? Do the tools even let you do that? Maybe an easier way is to provide a method on import where you pick a color that gets converted to [No Color/Any Color]. That would support any file types. maybe geting in touch with the LDRAW community, asking for such a reserved color (color 16 is not a good choice imo) would be an idea. But it may take years. The fact is that tou can enter the color number you like in the text files, so builder themselves can choose a color (like 999) that can be parsed here as "any color". MLCAD lets you pick colour 16 for top level parts, but I don't know about the other LDraw based editors, and it definitely wouldn't be the best solution long term. Short term, it would be great if, during import to Rebrickable, you could specify a colour that automatically gets mapped to the 'any colour', as others have suggested. That way, it doesn't mess up any workflows with the other LDraw tools. Ideally, the editors should allow you to specify a colour for such a part (to be used for rendering instructions, etc), but then have a separate flag of some sort to indicate that it can really be any colour. This would probably require a change to the LDraw file format though, which, realistically, will never happen. Not to mention all the other non-LDraw based editors people use. I don't think there is much use in assigning a special LDraw Color for this. Because, in the end the parts do need a specific color in the building instructions to show the builder which ones are random. For example in the Jedha City MOC linked in the post, all [any color] parts are red in the building instructions because the rest of the model has no red parts at all. So which color to use for [any color] in the building instructions can differ between models, or even parts of models.